This week I am in Australia. I spent 3 days staying in Geelong with Dijanne Cevaal, machine quilter extraordinaire! Now I am in Central Melbourne, where my husband will be giving a lecture tomorrow. 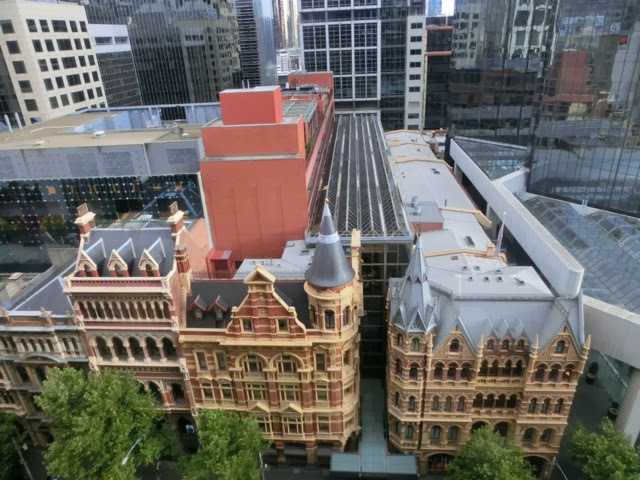 We are staying in a pretty amazing place on Collins st on the 12th floor which has a view out of the window showing a wide range of architectural styles. The hotel we face is the Intercontinental ( it has a chocolate shop right in front too which is hard to resist). 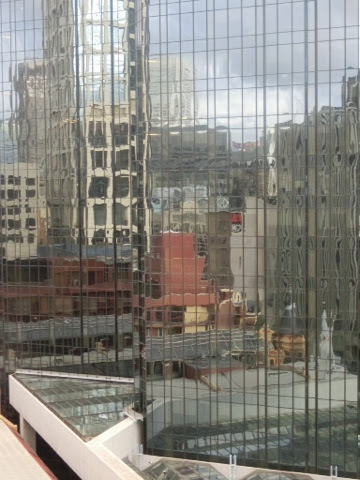 Behind that are high rise with all different window shapes and sizes and wonderful reflections. To the left middle is a building with windows that are a snowball quilt pattern. I might get a better shot tomorrow. This looks like a watercolour painting with all the reflections. It might be a bit hard to get to if you didn't have a car, but I believe they often have stalls at quilt shows and textile fibre forums. It is a great place to fossick and I bought a jacket made of recycled Indian saris which I couldn't resist. The jackets are from a social enterprise project in India run by Fiona Wright who also runs textile tours in Europe and India. 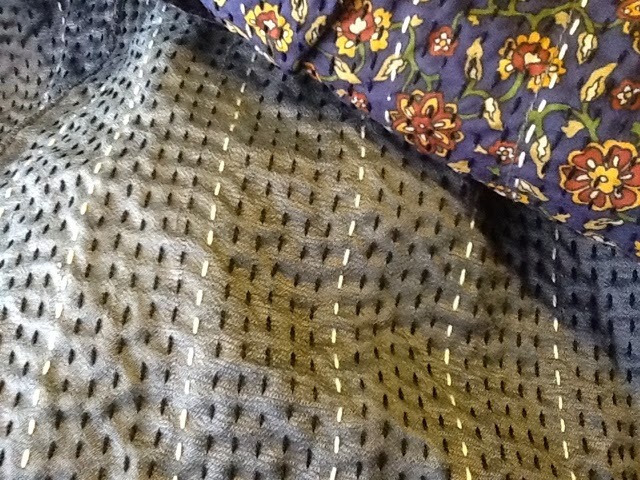 Here is a picture of the jacket fabric - yum! Tomorrow I am off to ' Beautiful Silks' in Fitzroy. Geelong quilters show is on the weekend after next, 23-24 th of November. Sorry not to include the links, I am scared that if I leave this page to find them I will lose the wifi. And then the sun came out in Melbourne!